1914-15 Star (LIEUT. F.R. BRITCHFIELD, R.N.) 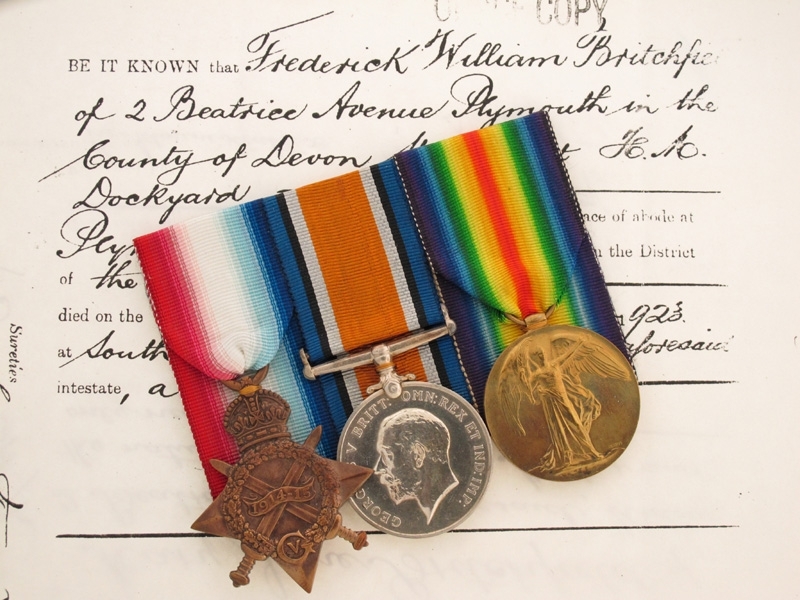 and British War and Victory Medals (LIEUT F.R. BRITCHFIELD. R.N.). Naming is officially impressed, crisp detail, beautiful patinas, extremely fine condition, board mounted. Also included is a duotang folder with his military biography, copies of three death notices and five ship photographs. Footnote: Frederick Russell Britchfield was born on September 5, 1865. He achieved the ranks of Gunner (1893) and Chief Gunner (1911), while serving aboard H.M.S. Dolphin (1893), Cambridge (1897), Hermoine (1901), Cambridge (1905), Vivid (1905), Duncan (1910) and Vivid (1912). It is worthy to note, that in December 1902, at a Court of Inquiry, the First Lords expressed displeasure at the evidence he gave. During WWI, he was in command of a small coastal destroyer, the T.B. 4 on North Sea patrols, as of August 1914. In November 1915, he was posted to one of his former ships, H.M.S. Vivid at the gunnery school at Devonport, training new gunners. On December 9, 1915, he was named a Lieutenant. On August 15, 1918, he was admitted to the Royal Naval Hospital Stonehouse for a carbunkle on his neck. This was later connected to his death of cancer of the neck. He retired in 1921 and died soon after, on February 4, 1923 at age 58.